Former Starbucks CEO Howard Schultz (SBUX) says his successor Kevin Johnson “deserves all the credit in the world” for the coffee giant’s recent success. “He is doing extraordinary. I mean, I'm so proud of him,” Schultz told Yahoo Finance in a wide-ranging interview. Johnson, a former technology executive, joined the Starbucks board a decade ago. He took over as CEO in April 2017. 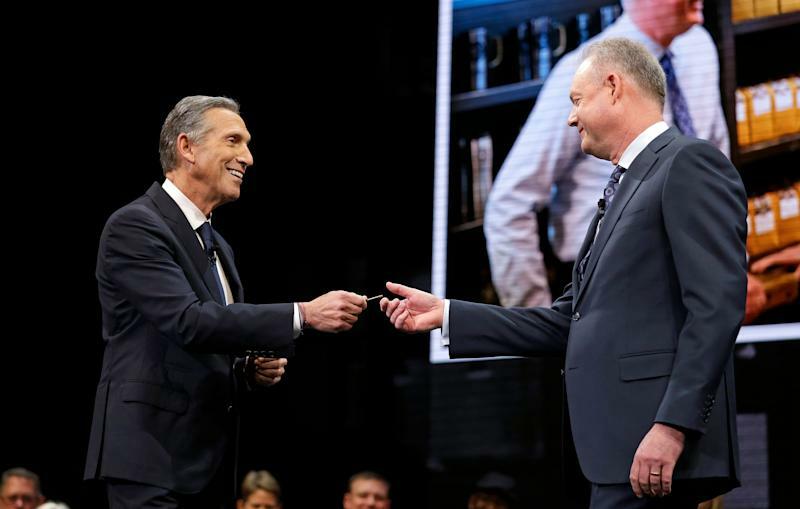 While at the helm of Starbucks, he’s focused on streamlining the company, as well as emphasizing the customer experience, the digital relationship with customers, and beverage innovation. The stock is also trading at an all-time high under his leadership. “He is bringing a level of innovation and transformation to the company. He's doing it his way. I have no engagement, no involvement, operationally, in the company whatsoever. That's the way it should be,” Schultz said. Schultz, 65, stepped down as CEO in April 2017. Just over a year later, he gave up his role as chairman in June. “I've removed myself from the board of directors, not only because I was considering running for president, because I didn't think it was fair to Kevin [Johnson] to have a shadow in the room. Because he needs to be his own man,” he said. Schultz is the architect behind the Starbucks as we know it today. He joined Starbucks in 1982, which at the time was a small seller of whole bean coffee with just four stores in Seattle. It was in 1983 when a 30-year-old Schultz took a business trip to Milan where he became enamored by the “romance” and “theater” of Italian espresso. The young Schultz saw the potential in translating the Italian espresso bar to Starbucks, but his idea was turned down by the initial founders. Soon after, Schultz left to set up his first coffee bar Il Giornale, named after a daily newspaper published in Milan. Schultz is currently “seriously considering” running for president as a centrist Independent. He told Yahoo Finance that if he were elected he would sell all of his Starbucks stock, about 33 million shares, a position valued at around $2.7 billion. During his time at Starbucks, Schultz was celebrated as a visionary leader who offered all employees, both part-time and full-time, comprehensive health benefits and equity in the form of stock options even before the company went public. More recent initiatives under Schultz’s leadership include college tuition and efforts around hiring military veterans and their families and opportunity youth.